Chris Burggraeve, a former Coca-Cola and AB InBev marketing executive, found his way into the cannabis industry after MBA students opened his eyes to the opportunity. He co-founded Toast, an upscale cannabis brand, where he now serves as the CMO. Chris Burggraeve – a former Coca-Cola and AB InBev marketing executive – found his way into the cannabis industry through an unconventional path: The corridors of New York University’s Stern School of Business. After Burggraeve left AB InBev in 2012, he turned to academia, teaching NYU master’s and MBA students around the world the ins and outs of marketing in the beverage industry. Five years ago, it was craft beer, not cannabis, that was on Burggraeve’s radar. But as Burggraeve taught, he said MBA and other high-level students began submitting proposals for his classes based on building businesses in the fledgling cannabis industry. “It piqued my interest,” Burggraeve said. Then, in 2016, Punit Seth, a Stern MBA student, found Burggraeve after class. “He pitched me the base idea of Toast – the back of the napkin story around it,” Burggraeve said. It was a cannabis brand geared towards the luxury, high-end market. He was sold. He co-founded Toast that same year, and now serves as the company’s Chief Marketing Officer, guiding the creative aspects of the brand. Seth serves as the CEO and “makes the trains run on time,” Burggraeve said. When Burggraeve and Seth teamed up in early 2016, there were few cannabis companies geared towards upscale consumers. At that time, Burggraeve said his peers from the CPG world looked at him as if he were from Mars when he discussed his idea to create a cannabis brand. That’s not to mention the steep learning curve with creating a product in an entirely new industry. Burggraeve decided to put personal money in, and with that “ownership mentality,” he and his team began scouring the cannabis market to look for opportunity. Courtesy of ToastA package of Toast pre-rolled joints. In March of 2017, Toast launched its first product – a package of low-dose, pre-roll joints – in Aspen, Colorado, tacking onto the resort town’s cachet as a luxury destination (and cannabis’s legal status in the state). 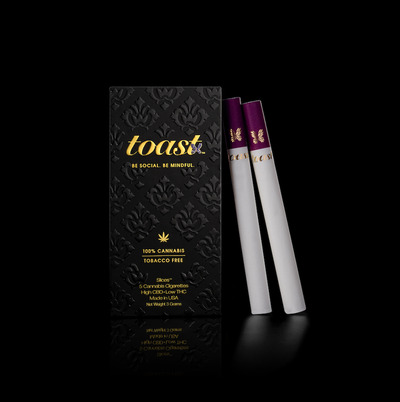 Toast has now rolled out an entire line of pre-rolled “slices,” or joints, that are carefully designed with low doses of THC and CBD – two of the active compounds in cannabis – to equal the strength of one drink. “We reinvented the joint,” Burggraeve said. “It’s the joint 2.0.” Like Coca-Cola, his former employer, he’s keeping the exact “blend” of ingredients in Toast products close to his chest. Toast’s “slices” are geared towards older marijuana users who may have more disposable income and are used to much less potent marijuana from the Woodstock era. “Baby boomers, by the way, are the richest cohort of the United States, and they love this. This is an adventure, but we want to give you control over the experience,” Burggraeve said. Burggraeve said he’s already seen how quickly the American consumer has evolved on cannabis- and how big of an opportunity the industry will become.